Tue., 10 Sep. - Sun., 22 Sep. Mon., 3 Feb. - Sun., 9 Feb. Mon., 2 Sep. - Mon., 23 Sep. Mon., 3 Jun. - Tue., 24 Sep. Mon., 1 Jul. - Tue., 2 Jul. See all 54 properties in Keflavik Intl. 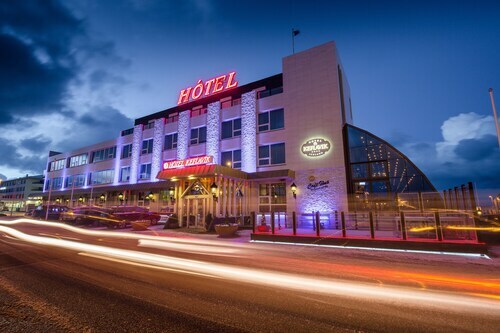 Situated near the airport, this hotel is within 3 mi (5 km) of The Icelandic Museum of Rock 'n' Roll, Reykjanes UNESCO Global Geopark, and Viking World Museum. Reykjanes Art Museum and Duus Hus Cultural Centre are also within 3 mi (5 km). 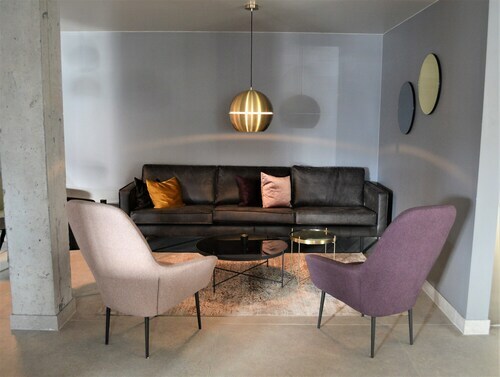 Located in the heart of Keflavik, this hotel is within 1 mi (2 km) of Reykjanes Art Museum, The Icelandic Museum of Rock 'n' Roll, and Duus Hus Cultural Centre. Viking World Museum is 2.8 mi (4.5 km) away. 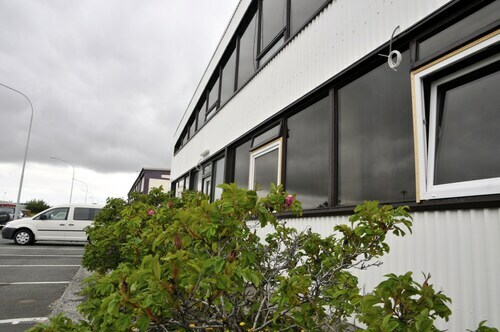 Situated near the airport, this hotel is within a 15-minute walk of Duus Hus Cultural Centre and Reykjanes Art Museum. The Icelandic Museum of Rock 'n' Roll is 1.6 mi (2.6 km) away. Situated near the airport, this guesthouse is within 3 mi (5 km) of The Icelandic Museum of Rock 'n' Roll, Reykjanes UNESCO Global Geopark, and Viking World Museum. Reykjanes Art Museum is 2.7 mi (4.3 km) away. Located in the heart of Keflavik, this hotel is within a 15-minute walk of Reykjanes Art Museum and Duus Hus Cultural Centre. The Icelandic Museum of Rock 'n' Roll and Viking World Museum are also within 3 mi (5 km). 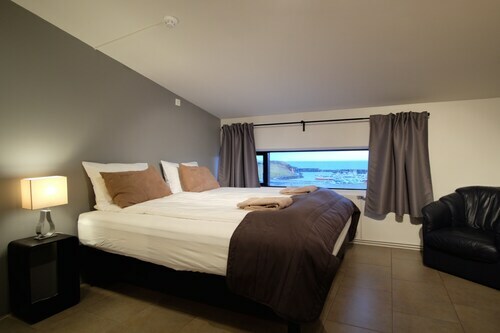 Situated in Keflavik, this guesthouse is within a 10-minute walk of Duus Hus Cultural Centre and Reykjanes Art Museum. The Icelandic Museum of Rock 'n' Roll is 1.6 mi (2.6 km) away. Located in Keflavik, this beachfront hotel is in the city center and within a 15-minute walk of Reykjanes Art Museum and Duus Hus Cultural Centre. The Icelandic Museum of Rock 'n' Roll and Viking World Museum are also within 3 mi (5 km). Question : How long does it take to fly from Montreal to Reykjavik? Answer : If you're able to take the direct flight (which is offered by WOW Air), you will be able to leave YUL at 6:15 PM EDT and get to KEF at 4:30 AM GMT (five hours and 15 minutes). Keep in mind, there is a time change of five hours. Answer : The cheapest day to fly from Montreal to Reykjavik is on Thursday. So, if you would like to save a bit of cash on your next business trip look for flights on that day. Question : How long is the flight from YUL to KEF? Answer : WOW Air can take you there in five hours and 15 minutes. So, if you were to leave Montreal at 6:15 PM EDT, you would get to Reykjavik at 4:30 AM GMT. Just enough time to catch up on your reading before your plane touches down. Don't forget the five hours time change. So, synchronize your watches. Question : Which airline has the least delays from Montreal to Reykjavik? Answer : Booking with Icelandair means you will arrive to Reykjavik pretty close to the time your ticket states. In fact, this airline has a 100% average for getting there on time. Question : How many flights are there per day from Montreal to Reykjavik? Answer : Yes, you can change your departure or arrival date. If you want to save some funds in doing so, the lowest-cost day to fly in April is Thursday. You might think you're missing out taking off a day early, but we think that you are just adding those savings towards your next trip. A dollar saved is a holiday earned. Question : How long do most people stay on their visit to Reykjavik? I didn’t have power charge plug in on first flight and baggage was slow coming off belt. Overall great experience with WOW air! Happy but we needed to pay a lot for every little extra. I would take Icelandair again HOWEVER it should be noted that the WiFi was not working on the flight and that the seating in economy was more claustrophobia-inducing than I have experienced before on an international flight. I really enjoyed the stewardess on the flight. Very polite. Flights from Pearson Intl. to Jose Maria Cordova Intl. Flights from Pearson Intl. to Guarulhos Governor Andre Franco Montoro Intl. Flights from Pearson Intl. to Henri Coanda Intl. Flights from Pearson Intl. to Oakland Intl.